As per request, here are all of my issues in one thread/post. 1) When I have subscription set up as “recurring”… it says “Your subscription ends January 1970”. When its non-recurring its correct as 2015. 2) When I have my subscription set up as “recurring”… my buyers/sellers get a checkout alert that “shipping must be defined”, and are unable to complete checkout. When its set up as non-recurring its correct and they can check out fine. 3) A seller of mine has a 2 product subscription… she added 1 product fine, and added a 2nd product… the 2nd product she went into change category and now its “gone” and she is unable to add a 2nd product back it… says she needs a new subscription for more then 2 items. I have checked, and find no 2nd product for her.. so unsure how to fix and give her what she is subscribed for. i just submitted the info… thank you. IN ADDITION… I cannot find where to SHUT OFF the product notifications. Every product that is entered by a seller is coming into my in box. I'd like to turn this OFF, but cannot find where to (or a previous thread on it). AND NOW… Paypal will not approve my api acount…. it is telling me I cannot use Paralell or Chained payments… I must do API pre-approved. What I want.. My site is COMMISSIONS FREE. The seller pays me a monthly subscription fee, no commission. Paypal is telling due to this, I cannot do anything BUT API PREAPPROVED. Which means my sellers will have to fool around with their paypal accounts and “approve” me. I do not want this… this is a turn off for sellers, one more step for them to sell and they will turn away from it. I have invested a lot in my site and Dokan/Wedevs… please help ASAP. I got your details. Please allow me some time to check your site. I have checked your site. From my account i have created a sub pack and purchase is from seller account and it is showing the right date in the front-end. I think there was a problem with your date or the creating way of your sub pack. However… did you make the subscription RECURRING? If its nonrecurring it works (date) fine… if its recurring… it doenst work. In addition... did you look into the OTHER issue of the subscription? Why it is asking sellers to “select shipping” when they choose a recurring subscription? Right now, I have all subs set to NON RECURRING, so I can get people set up…. but if you switch one (make a new one) to a recurring.. they dont check out. 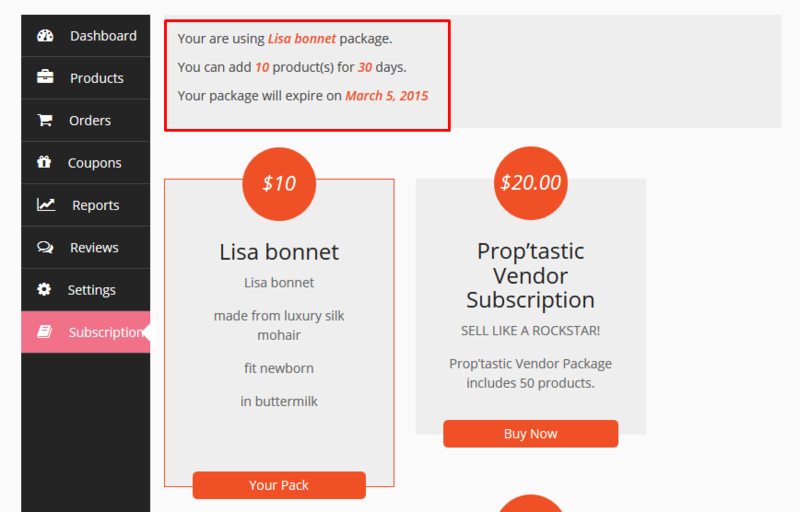 Ps, please do not change/edit any of the product in the cart (like the lisa bonnet you changed), its a sellers REAL product… as we are trying to prestock the site for “live”. I am checking again your site. Please allow me some time. I have discussed with our developer team. The recurring sub pack will work fine with PayPal payment method. Did you try with PayPal?. Please let me know. Well I set everything to PAYPAL as your request… and the sellers payments are now coming to ME, and not to the sellers paypal account. If I set up PAYPAL ADAPTIVES API… the payments go to sellers… BUT PayPal will not approve my account like this. If I set up with PAYPAL EXPRESS … like paypal says to do, and switch my Dokan to PAYPAL… the payments go to ME and not my sellers…. 1) A seller of mine has a 2 product subscription… she added 1 product fine, and added a 2nd product… the 2nd product she went into change category and now its “gone” and she is unable to add a 2nd product back it… says she needs a new subscription for more then 2 items. I have checked, and find no 2nd product for her.. so unsure how to fix and give her what she is subscribed for. 2) My subscriptions cannot be RECURRING. They are only “accepted” by the system if they are non-recurring. See images… I “bought” a subsrpiption, but it wasnt in my shop after checkout (see image) . I set them up as stated in your directions (see image). 1. I am not clear about your problem. If you have already uploaded 2 products then you cant upload any more. If you have uploaded 2 products and then deleted one and again you tried to upload a product then you will not be able to do that. 2. After confirmation of the payment for the sub pack the seller or you will be able to get the pack. If your payment is not confirm yet then you can not see them in your dashboard. 1) She added 2 products, but when she went to edit the 2nd product… it was NOT there any longer… and the system will not let her re-ad. So she only has ONE. 2) The order is showing up in my ORDERS listing… saying it was purchaed, however the subscription is not in my seller account. Is there the possibility of hiring a developer?